November 11, 2017 is a day to remember for the Society of Vascular and Interventional Neurology (SVIN). 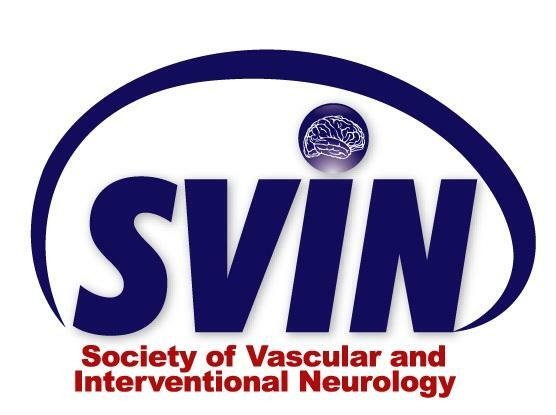 Simultaneous with the online publication in the New England Journal of Medicine (NEJM), Dr Tudor Jovin, former SVIN president, and Dr. Raul Nogueira, outgoing SVIN president, the two principal investigators of the DAWN study, presented their trial at the Society of Vascular and Interventional Neurology 10th Annual Meeting in Boston today. Removing blood clots in stroke patients presenting late (after 6 hours, before 24 hours), or who wake up with symptoms, with select clinical and imaging criteria, reduces disability from stroke. Dr. Tudor Jovin presented breaking results from subgroup analyses that were made public for the first time. Their combined presentation was a big milestone in the history of stroke research and was received with a standing ovation. In addition to the Principal Investigators, numerous other national and international SVIN members, many of whom were present in the audience, were co-authors, making up almost half of the NEJM publication authorship. The DAWN trial was halted after enrollment of 206 patients (107 assigned to thrombectomy, 99 to standard care) across the United States, Canada, Europe and Australia. Patients were included if they presented 6 to 24 hours from last known well symptom onset, with NIHSS >10, had a large vessel occlusion by CTA or MRA, and clinical-imaging mismatch between the neurological deficit and infarct size as below (Table 1). Patients were randomized between standard medical care vs thrombectomy with the Trevo Stent retriever. Rescue reperfusion therapy was not permitted other than carotid angioplasty to obtain intracranial access if needed. The trial was stopped at 31 months for superiority of thrombectomy. Median initial NIHSS was 17 in both groups. Median time from last seen well to randomization was 12.2 vs 13.2 hours in the thrombectomy and control groups, respectively. General anesthesia was used in 11 (10.3%) of patients. Reperfusion was achieved in 84% by core lab evaluation. Dr. Nogueira explained there were two co-primary endpoints. The utility weighted modified Rankin Score (UW-mRS) measured the spectrum of clinical outcome with weighting of each mRS level according to patient and health care provider value (5.5 vs 3.4, in favour of thrombectomy). Second co-primary endpoint was independence at 90 days, defined as mRS 0-2, which was achieved in 48. 6 % vs. 13.1% in favour of thrombectomy. For every 2.8 treated patients one additional patient was functionally independent at 90 days. Symptomatic intracranial hemorrhage (5.6% vs 3.0%, p=0.50) and 90-day mortality (18.7% vs 18.2%. p= 1.0) did not differ significantly between groups, respectively for thrombectomy and medical therapy. Procedural complications occurred in 7.5%. Dr. Jovin then showed that the benefit of thrombectomy was noted in all of the pre specified subgroups of the patient population enrolled regardless of mode of presentation (wake-up stroke, unwitnessed, or witnessed onset stroke symptoms beyond 6 hours from last seen well, age, gender, arterial occlusion site (MCA vs intracranial ICA) and baseline infarct volume. In addition, benefit was noted across the entire 6-24 hour period from time last seen well to randomization. "The DAWN study is the first endovascular stroke trial to show that treating patients with large vessel occlusion presenting in later time windows (6 to 24 hours) with clinical – imaging mismatch is a very powerful treatment in reducing disability for this particular subtype of stroke," commented Thanh Nguyen, MD, chair of the SVIN 10th Annual Meeting. "The investigators are to be congratulated for the thoughtful conception and excellent execution of this study." Thomas Devlin, MD PhD chair of the SVIN Stroke Center Workshop remarks "The overwhelmingly positive results of the DAWN trial have shattered the 6 hour time window. Its implications on clinical care will be far reaching and demand that we rethink all current prehospital and emergency department stroke protocols. Congratulations to all." Diederik Dippel, MD PhD from Erasmus MC, Rotterdam, the Netherlands, who was one of the PIs of the MR CLEAN trial cites "The DAWN trial shows us that selected patients with uncertain or late times of onset may benefit enormously from prompt thrombectomy, if imaging shows only minimal irreparable damage. The DAWN trial is a great achievement as it opens a new perspective on the 'Time is brain' paradigm, and I am looking forward to studies that confirm these results and show effectiveness in everyday practice." Nogueira RG, Jadhav A, Haussen DC, Bonafe A, Budzik RF, … Jovin TG et al. Thrombectomy 6 to 24 hours after Stroke with Mismatch between Deficit and Infarct. NEJM November 11, 2017. Presented at Society of Vascular and Interventional Neurology 10th Annual Meeting, Boston, MA.